Happy birthday Oracle -- 30 years! On June 16, Oracle celebrated its 30th birthday. Rich Niemiec takes a look at Oracle's major milestones over the past three decades. On June 16, 1903, Ford Motor Company was incorporated and the Industrial Revolution started to hit a major acceleration point. On June 16, 1977, a similar event occurred with the incorporation of Oracle Corporation (then called Systems Development Laboratories -- SDL). Oracle celebrated its 30th anniversary on June 16, 2007, as a multi-billion-dollar company literally supporting every major business. It's amazing to look back on the history of Oracle Corporation and the diverse team that has led to its success. Larry has been the driving factor of Oracle the company, but Bob Miner, whose Assyrian family emigrated from Ada, Iran, was the driving factor of Oracle the product. America is all about freedom, resilience and opportunity. Larry Ellison and Bob Miner are examples of what is possible in a free society. Larry's surname is even based on Ellis Island. Larry's entrepreneurial success story shows that anything is possible where people enjoy freedom and an entrepreneur spirit burns. On the Statue of Liberty it reads: "Give me your tired, your poor, your huddled masses yearning to breathe free, the wretched refuse of your teeming shore. Send these, the homeless, tempest-tost to me, I lift my lamp beside the golden door!" That golden door eventually led Larry to the Golden Gate Bridge and the establishment of Oracle Corporation in Silicon Valley in 1977. Prior to forming Oracle, Bob Miner was Larry Ellison's manager where they worked at Ampex together on a CIA project code-named "Oracle." Larry chose Bob as his manager because he liked Bob a lot more than his original manager. Ed Oates, another founder of Oracle, happened to be walking by Bob Miner's door when Larry Ellison mentioned his (Larry's) wife's name. It turned out to be Ed Oates' lab partner from high school. Bruce Scott, who would be hired upon the formation of the company, is the "Scott" in scott/tiger (Tiger was Bruce's daughter's cat). When Larry went on to work at Precision Instruments, he discovered Precision Instruments had a need to do a $400,000 consulting project. For three or four engineers, that was a lot of money back then, since wages were about one-tenth what they are now. Larry landed the deal. Larry was not part of the new company when it was founded; he was still at Precision Instruments. The new company was called Software Development Labs (SDL). We had three employees when we started the company in August of 1977. Bob Miner was the president; Ed Oates and I were both software engineers. We did 90% of the work on this two-year project in the first year, so we had the next year to work on Oracle. Ed Oates finished the other 10% of the project over the next year while Bob Miner and I started to write the Oracle database. When we completed the Precision Instruments work, we had about $200,000 in the bank. We decided that we wanted to be a product company and not a consulting company. Bob wanted to build an ISAM product for the PDP11. He felt there was a need for an access layer. Larry wasn't interested in that at all. Larry had been following what IBM was doing and he found a paper on the System/R based on Codd's 1970 paper on relational databases. It described the SQL language, which was at the time called SEQUEL/2. Larry brought us the paper and asked if we could build this. We thought that it would be easy enough to do. So we started. I was 24 years old at the time, Bob was about 15 years older than me, and Larry was about 10 years older than me. I left Oracle in 1982 after about five and a half years working there. When I left, we had just finished version 3 of the database. Roughly half the code was mine and half was Bob's. I believe that a lot of the parser code in the current database may still be mine. Bruce Scott said that his best day was Oracle's first user's conference. This was a customer conference that we put on. It was in 1982 and it drew about 25 to 50 people. It was beginning to catch on. In a 1998 Nicole Ricci Interview, Larry Ellison said, "In fact, when I started Oracle, the goal was never to have a large company. At best, I hoped we would have 50 people in the company and make a good living. About five years into the company, it became pretty clear that the horizons were unlimited. The only limitations were us." Here's a timeline of how things progressed. 1970 -- Dr. Edgar Codd publishes his theory of relational data modeling. 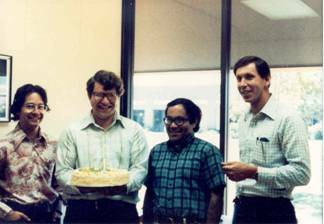 1977 -- Software Development Laboratories (SDL) formed by Larry Ellison, Bob Miner, Ed Oates and Bruce Scott with $2,000 of startup cash. Larry and Bob come from Ampex where they were working on a CIA project code-named "Oracle." Bob and Bruce begin work on the database. 1978 -- The CIA is the first customer, yet the product is not released commercially as of yet. SDL changes its name to Relational Software Inc. (RSI). 1979 -- RSI ships the first commercial version, Version 2 (there is no V1 shipped on fears that people won't buy a first version of software) of the database written in Assembler Language. The first commercial version of the software is sold to Wright-Patterson Air Force Base. It is the first commercial RDBMS on the market. 1981 -- The first tool, Interactive Application Facility (IAF), which is a predecessor to Oracle's future SQL*Forms tool, is created. 1982 -- RSI changes its name to Oracle Systems Corporation (OSC) and then simplifies the name to Oracle Corporation. 1983 -- Version 3, written in C (which makes it portable) is shipped. Bob Miner writes half, while also supporting the Assembler-based V2, and Bruce Scott writes the other half. It is the first 32-bit RDBMS. 1984 -- Version 4 released. First tools released, (IAG-genform, IAG-runform, RPT). First database with read consistency. Oracle ported to the PC. 1985 -- Version 5 and 5.1 are released. First Parallel Server database on VMS/VAX. 1986 -- Oracle goes public March 12 (the day before Microsoft and eight days after Sun). The stock opens at $15 and closes at $20.75. Oracle Client/Server is introduced; first client/server database. Oracle5.1 is released. 1987 -- Oracle is the largest DBMS company. Oracle Applications group started. First SMP (symmetrical multi-processing) database introduced. 1987 -- Oracle's Rich Niemiec along with Brad Brown and Joe Trezzo working at Oracle (now at TUSC) implement the first production client/server application running Oracle on a souped-up 286 running 16 concurrent client/server users for NEC Corporation. 1988 -- Oracle V6 released. First row-level locking. First hot database backup. Oracle moves from Belmont to Redwood Shores. PL/SQL introduced. 1992 -- Oracle V7 is released. 1993 -- Oracle GUI client/server development tools introduced. Oracle Applications moved from character mode to client/server. 1994 -- Bob Miner, the genius behind the Oracle database technology, dies of cancer. 1995 -- First 64-bit database. 1997 -- Oracle8 is introduced. Oracle Application Server is introduced. Applications for the Web introduced. Oracle is the first Web database. Oracle BI tools like Discoverer are introduced for data warehousing. Tools have native Java support. 1998 -- First major RDBMS (Oracle8) ported to Linux. Applications 11 shipped. Oracle is the first database with XML support. 1999 -- Oracle8i released. Integrates Java/XML into development tools. Oracle is the first database with native Java support. 2000 -- Oracle9i Application Server released; it becomes the first database with middle-tier cache. Launches E-Business Suite, wireless database with OracleMobile, Oracle9i Application Server Wireless and Internet File System (iFS). 2001 -- Oracle9i (9.1) released. Oracle is the first database with Real Application Clusters (RAC). 2002 -- Oracle9i Release 2 (9.2) released. 2003 -- Oracle at France Telecom is No. 1 on Winter Group's Top 10 in DB size at 29TB. 2003 -- Oracle10g comes out -- Grid-focused, Encrypted Backups, Auto-Tuning and ASM. 2005 -- Oracle RAC at Amazon hits the Winter Group's Top 10 in DB size at 25TB. 2005 -- Oracle buys PeopleSoft (includes JD Edwards), Oblix (Identity Management), Retek (Retail) $630M, TimesTen (in-memory DB) and Innobase (InnoDB Open Source). 2006 -- Oracle buys Siebel for $5.8B, Sleepycat Software (Open Source) and Stellant (Content Management). Oracle with an Open Source push offers "unbreakable" support for Red Hat Linux. 2006 -- Oracle10g Release2 comes out in fall. 2007 -- Oracle buys Hyperion for $3.3B. 2007 -- Oracle 11g comes out (predicted based on prior releases). I asked Bruce Scott what made Oracle successful in his mind. Bruce said: "I've thought about this a lot. I really think that it was Larry. There were a lot of other databases (like Ingres) out there that we beat. It was really Larry's charisma, vision and his determination to make this thing work no matter what. It's just the way Larry thinks. I can give you an example I tell people that exemplifies his thought process: We had space allocated to us and we needed to get our terminals strung to the computer room next door. We didn't have anywhere to really string the wiring. Larry picks up a hammer, crashes a hole in the middle of the wall and says there you go. It's just the way he thinks, make a hole, make it happen somehow. It was Larry, the right thing and the right time." I always tell people that Larry Ellison is the genius behind Oracle, the company with Charles Phillips, Safra Catz, Keith Block and Judith Sim driving Larry's vision today; Bob Miner was the genius behind Oracle, the product. Bob Miner's development spirit has continued on through Derry Kabcenell, Roger Bamford, Andy Mendelsohn, Ken Jacobs, Thomas Kurian and many others. The combination of the diverse team Oracle has had over the years is the secret of their success! Happy birthday Oracle! Rich Niemiec, 45, is CEO of TUSC. TUSC is an Inc. 500, Chicago-based systems integrator of Oracle-based business solutions. TUSC was the Oracle Partner of the Year in 2002 and 2004. Rich is a past president of the International Oracle Users Group (IOUG) and the current president of the Midwest Oracle Users Group (MOUG). Rich is one of six originally honored worldwide Oracle Certified Masters. Rich's Oracle10g Tuning book will come out in June 2007. 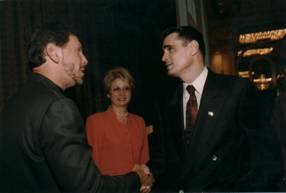 Along with TUSC co-founders Brad Brown and Joe Trezzo, Rich won the Ernst & Young Entrepreneur of the Year Award in 2001. Rich was inducted into the Entrepreneurship Hall of Fame in 1998.